This exclusive lodge is on the 60,000 acre Wyuna high country station on the northern shore of Lake Wakatipu- two miles from the small town of Glenorchy and a 45-minute drive from Queenstown. The lodge was recognized its first full year in service by Andrew Harper's Hideaway Report, winning “Hideaway of the Year” in 2000. As a multi-million dollar project, the lodge will appeal to those seeking privacy in a unique and secluded setting. Boasting not only luxury accommodations but varied adventure activities and high end service, Blanket Bay is an excellent location for accessing fly fishing waters throughout the region. Accommodations are provided in lakeside rooms and suites, filled with sumptuous furnishings and rich rugs. Natural materials are employed widely throughout, reflecting the lodge's special relationship with the environment, and all rooms are placed to take full advantage of the magnificent lake and mountain views. Lakeside rooms feature their own balcony or terrace; king-size bed; built-in closet and en suite bathroom with granite topped double vanities, separate shower and bath. Lodge Suites are 800 sq. 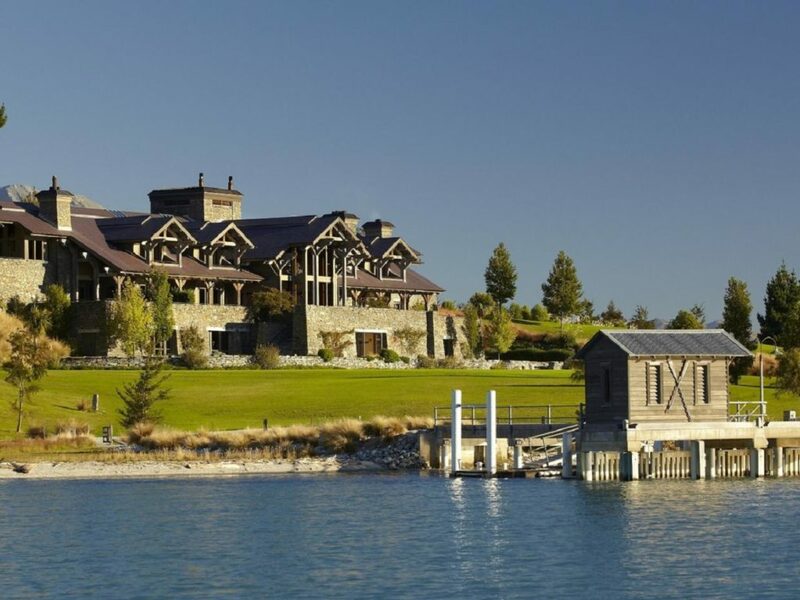 ft. and offer bedroom and sitting areas with their own stone fireplace; capacious bathroom with steam shower and separate tub; and 700-sq.-ft private terraces, which feature heart stopping views of Lake Wakatipu across to the Humboldt Mountains in the west. Chalets have four additional suites that reflect New Zealand colonial architecture and complement the main lodge through the use of shiest stone and timber beams. 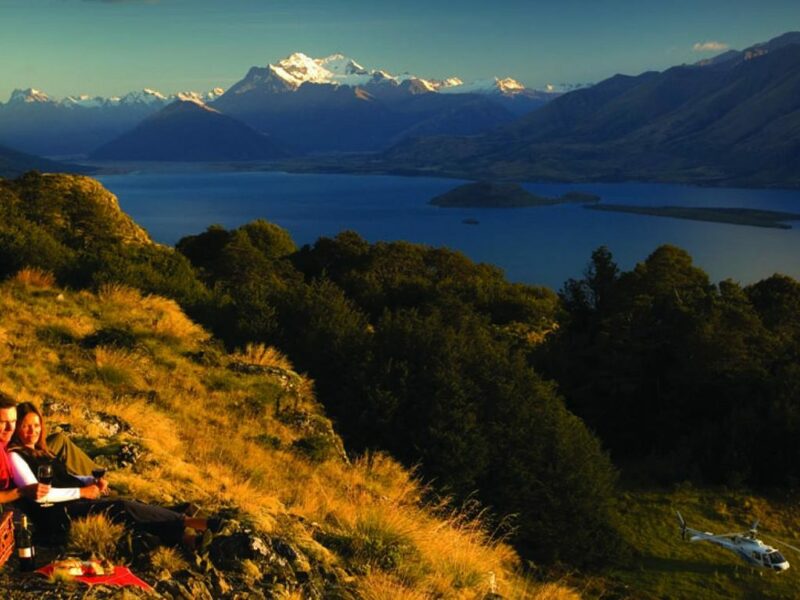 These enjoy stunning views over Stone Creek and down the length of Lake Wakatipu, with the Richardson mountain range towering above. Dining is an integral part of the experience at Blanket Bay. The lodge specializes in Pacific Rim cuisine and offers guests an a la carte menu that changes nightly. Dinner is served at private tables in one of two dining rooms, both with views of the lake, as well as dining on an outdoor terrace or in a romantic candlelit wine cave. At the heart of the Lodge is the 30-foot-high Great Room with its massive log fireplace, vaulted wharf timber beams and antique wooden floors. Relax by a crackling indoor or outdoor fire and watch the red gold sun set behind the magnificent snow-capped Humboldt Mountains. Other facilities include a spa, a steam room, a gym, massage treatment rooms, a game room and a lap pool. Experienced professional fishing guides offer some outstanding fly fishing options. The famous Lochy River, accessed across Lake Wakatipu by boat; the Routeburn River and evening rise on Diamond Creek, by 4WD; or helicopter into some of New Zealand's wilderness streams that are within a 15 minute flight. Fly or spin fishing from the lodge boat along the lake shore is an alternative for those who are less mobile or desire a less strenuous fishing experience.